Charles A. Ellis – was educated in Springhill and attended Dalhousie University from which he received his B.A. in 1977. He attended Dalhousie Law School from which he received his LL.B in 1980. He was admitted to the Nova Scotia Bar in 1980 and to the New Brunswick Bar in 1986. Charles is an Assistant Crown Attorney. His preferred areas of practice are: Family Law, Real Estate Law, Wills, Estates and Corporate Commercial. Charles is a member of the Nova Scotia Barristers’ Society, Canadian Bar Association and the Cumberland Barristers’ Association and has held all Executive positions within that organization. Charles is a member and Past-President of the Springhill Rotary Club. He is Past-president of the Junction Road Elementary Home & School Association. Charles is very active with minor hockey and soccer serving as a coach with various teams. David McNairn – was born in Amherst, Nova Scotia. He attended the University of Western Ontario for his undergraduate degree and went on to receive his LLB from the University of New Brunswick in 2003. In 2004 David began his legal career with Hicks LeMoine Law with a focus on real estate, corporate/commercial law, municipal law and estate planning. David became a partner at Hicks LeMoine in 2009. David has been an active volunteer in the community. He has served on the board of directors and executive for the Amherst & Area Chamber of Commerce from 2005 through 2009. He has also been a member of the Rotary Club of Amherst since 2005 and served as President of the Rotary Club for the 2017/2018 year. David also currently sits on the board for the Cumberland Business Connector. 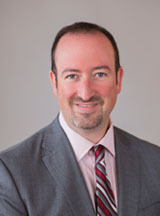 Within the legal profession, David has served as President of the Cumberland Barrister’s Association and was a member of the council for the Nova Scotia Barrister’s Society from 2008 to 2013. David has also spent a number of years on the Complaints Investigation Committee and the Complaints Review Sub-committee. Currently, David serves on the board of the Real Estate Lawyer’s Association of Nova Scotia. David is licensed to practice in both Nova Scotia and New Brunswick working primarily out of the Amherst office. Joshua E. Cormier – was educated in Dorchester and Sackville, New Brunswick and attended Dalhousie University from which he received his B.A. in 2007. He received his LLB from the University of New Brunswick in 2010, at which time he began his legal career with Hicks, LeMoine. He was admitted to both the Nova Scotia Bar and New Brunswick Bar in 2011. Josh became a partner in 2017. Josh’s preferred areas of practice include: Real Estate Law, Wills, Estates, and Family Law. Josh is a member of the Nova Scotia Barristers’ Society, Canadian Bar Association and the Cumberland Barristers’ Association. Josh is also a member of the Dorchester Volunteer Fire Department and the Sackville Rotary Club. 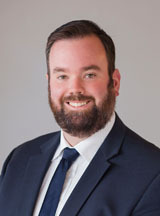 Josh has acted in a number of administrative positions for various organizations including Secretary/Treasurer for the Cumberland Barristers’ Association, The Board of Directors for the Greater Sackville Chamber of Commerce, the President of the Rotary Club and the Cumberland Barrister’s Association. Thomas L. MacLaren – was born and educated in Halifax, Nova Scotia, having spent the summer holidays of his youth in Parrsboro. He attended Acadia University, graduating in 2007 with a Bachelor of Arts degree. He received his LL.B from Cardiff University in Wales, UK after which he attained a Certificate of Qualification from the National Committee on Accreditation of the Federation of Law Societies of Canada. He was called to the Bar in Nova Scotia on April 12, 2013. Tom accepted an articling position with Hicks LeMoine Law in 2012 and became a partner in 2017. Tom’s preferred areas of practice include Real Estate Law, Wills, Estates and Probate, and Family Law. 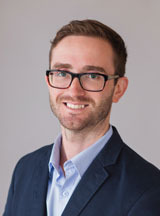 Tom is appointed as a per diem Crown Attorney working in Amherst, Truro, Antigonish and Shubenacadie on behalf of the Public Prosecution Service. Tom is a member of the Nova Scotia Barrister’s Society, and the Canadian Bar Association. 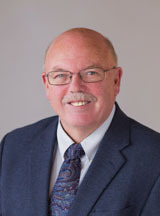 Tom has served on the executive of the Cumberland Barrister’s Association, the Parrsboro and District Board of Trade and the Parrsboro Creative. Tom is an avid golfer and traveler. Anastacia Merrigan was born in Truro and raised in Hants County. She received a Bachelor of Arts degree at Mount Allison University in 1999 and a Juris Doctor from the University of New Brunswick in 2016. Anastacia completed articles at Hicks LeMoine Law’s Amherst office and has lived in Sackville, NB since 2004. She was called to the bar in Nova Scotia and New Brunswick in 2017. Anastacia’s preferred areas of practice include Civil Litigation, Family Law, Criminal Law, and Corporate Law, particularly Small to Medium Business and Social Enterprise start-ups. 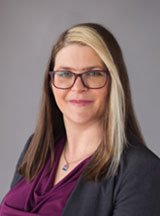 She is a member of the Canadian Bar Association, the Nova Scotia Barristers’ Society, and currently serves on the executive of the Cumberland County Barristers’ Association and the Collaborative Family Law Association of Nova Scotia. Anastacia is also a member of the Sackville Commons Co-working Co-operative, Rotary (Sackville), and EOS Eco-Energy (Sackville). In 2019, she began a three year term on the Family Law Standards Committee for the Nova Scotia Barristers Society. Outside of the office, Anastacia is passionate about close-up photography, LGBTQ+ advocacy, crochet and power tools.